Everyone has a favourite motorcycle run. Tell us about it. The winner of the gift basket drawn at the 2012 Motorcycle Show in Toronto was Sherri Stainforth from Ingersoll, Ontario. She visits the area several times a year and loves the coastal ride featured on the Cruise the Coast map. She and her family are avid riders who love cruising all through Ontario’s South Coast. She sent a great letter of thanks. I have enjoyed quite a few of the prizes that were included in the package that I have received from winning the package from the 2012 Toronto Motorcycle Show and will continue to enjoy a few other that haven’t been used yet and would like to thank all the sponsors who put the prize together. 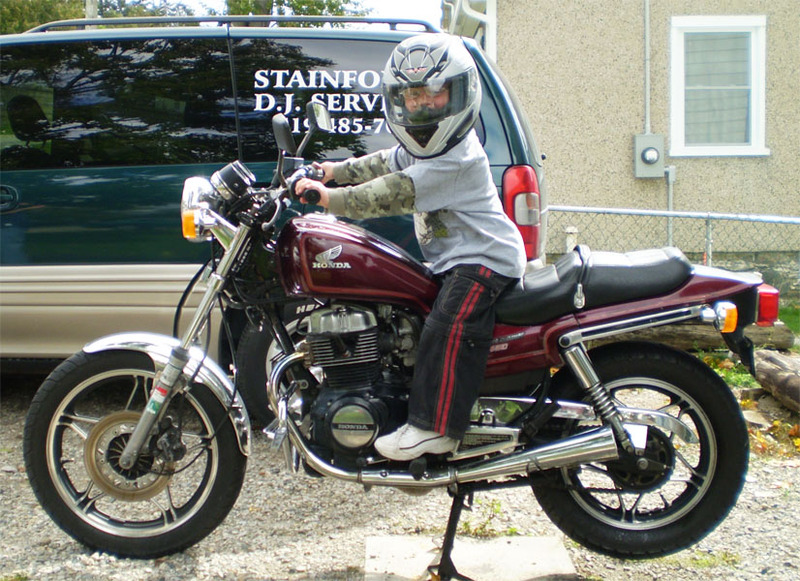 A couple years ago I took my son on one of the most memorable rides I have ever been on. It was the bead for kids who have cancer on Canada Day. I asked my son if he wanted to go with me. He said with excitement “yes”, so off we went to Nairn, a small community just north of London, On. There we met up with a few other avid motorcyclists (not a lot of children) me being new to all this was surprised that a lot of children don’t get the opportunity to do this. We left from there and our first stop was in Bayfield at a little restaurant the main street through town where we stopped and had lunch and met with even more riders. This was a cruise at your own pace ride. After lunch we got back on the bikes and headed off to Blythe to the Old Mill for some shopping and just another little break and pick up more beads. Then we were off to Hensall to the Ice Carving Factory. There we watched them carve ice both from hand and lazer. They gave us a full tour of the machines they have that create the big ice blocks and showed us containers that they use to ship the carved ice all over the world. A lady was carving a beaver holding a canadian flag for the upcoming Canada Day celebrations. On a hot day standing in a huge freezer with all your motorcycle gear on was refreshing. Our next stop was in Exeter at Country Corners ATV, here we got to jump on the little ATV and drive around the little track they have at back this was fun. After that it was back to Nairn for a rib Dinner. My son got to run his legs off for a bit at the playground at this time there was now about 5 children in total. After dinner we headed back home for the last hour of the ride my son was asleep. Don’t worry for all you parents out there I have one of the harnesses for children to ride motorcyles they are a great investment for those that like to take their children on any ride. I am hoping to get out on a lot more rides and have my son join me on them again as you get to meet a lot of very nice people who you may or may not normally hang around with. Bring on the riding weather! January 4, 2013 – See you at the Canadian Motorcycle Supershow, running today through Sunday at the Canadian Motorcycle Super Show in Toronto. Here are some news articles and reports about Port Dover’s Friday 13th.